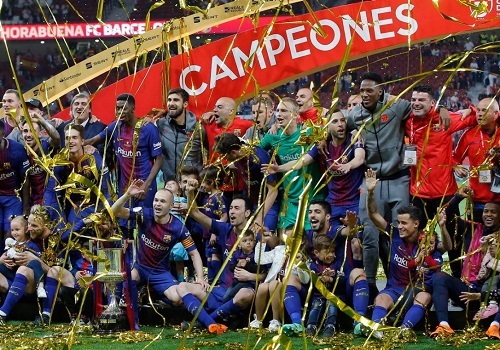 FC Barcelona won their 30th Copa del Rey crown following their impressive 5-0 victory over Sevilla at the home of Atletico Madrid’s stadium, the Wanda Metropolitano. The Blaugrana won the Copa del Rey in four consecutive years which had not been done since 1933 when Athletic Bilbao accomplished the same feat. The goals scorers were Luis Suárez, who opened the scoring in the 14th minute and Lionel Messi scored the second in the 31st minute, before Suárez scored his second in the 40th minute. Captain Andres Iniesta scored in the 52nd to make it 4-0 before Philippe Coutinho rounded off the evening with the fifth goal being scored from the penalty spot in the 69th minute. Barça took part in their fifth consecutive Copa del Rey Final and made it a memorable occasion. The match against Sevilla was a one-sided contest. It took the Blaugrana 14 minutes to open the scoring which was initiated by Jasper Cillessen’s excellent long ball down the pitch for Coutinho who drove towards goal before lifting the ball over the oncoming Sevilla keeper, David Soria, at the near post which allowed Suárez to score from close range. 17 minutes later, Barça doubled their lead after Jordi Alba played a sublime one-two with Iniesta, before putting an exquisite backheel pass for Messi who blasted the ball high into the roof of Sevilla’s goal. Barça’s third and final goal of the half came five minutes before the halftime whistle after Messi delivered a wonderful through ball that eluded numerous Sevilla players in the middle of the park for Suárez, who managed to out race his opponents and blast the ball past Soria. The second half would be no difference as the Blaugrana continued to dominate Sevilla. Seven minutes into the second half, the captain, Andres Iniesta, scored in what would be his final Copa del Rey Final. He was put through on goal by Messi and Iniesta displayed the magic that we come to enjoy over the years that allowed him to evade Soria before scoring from a tight angle. New signing Coutinho got to join in the festival of goals when he converted from the spot in the 69th minute. In the 88th minute, Iniesta walked off the pitch to a standing ovation from of fans of both sides. 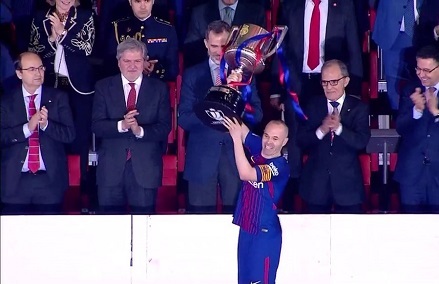 The captain would go on to hoist the trophy for the 30th time in club history as Barça got to celebrate the first title of 2017-2018. Barça can celebrate their second title of the season on Sunday with a win or a draw away to Deportivo. Sevilla FC: David Soria; Jesús Navas, Mercado, Lenglet, Escudero (c); N’Zonzi, Banega; Sarabia (Layún, 82), Franco Vázquez (Nolito, m. 86), Correa (Sandro, m. 46); & Muriel. FC Barcelona: Cillessen; Sergi Roberto, Piqué, Umtiti, Jordi Alba; Coutinho (Dembélé, m. 82), Rakitic, Busquets (Paulinho, m. 76), Iniesta (c) (Denis Suárez, m. 88); Messi & Suárez. Goals: 0-1, Suárez (m. 14); 0-2, Messi (m. 31); 0-3, Suárez (m. 40); 0-4, Iniesta (m. 52); 0-5, Coutinho (m. 69 – penalty). Cuations: Mercado (m. 34), Escudero (m. 38), Iniesta (m. 67), Franco Vázquez & Busquets (m. 74). Previous PostBarça play to a 2-2 draw with Celta Vigo. Next PostBarça win 25th league title after 4-2 victory over Deportivo.